You are almost certainly familiar with the changing landscape of media viewership in the US. The battle between traditional and newer media has many fronts, which has led to hypotheses attempting to answer “why” each is occurring. 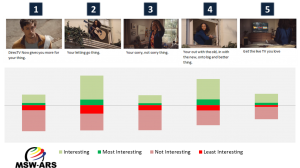 First, for context, we will take a step back to explain: On the surface, both mediums return fairly similar overall exposure levels – with Live TV edging Online Video by about eight points. However, when one breaks this data out by the standard generational age groups, it is easy to see why this is indeed a “battle” between these two mediums. 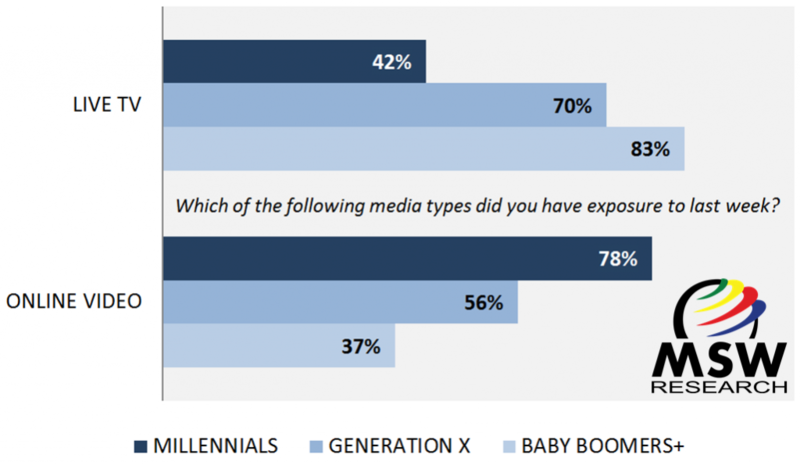 Live TV viewership among Millennials is roughly half of what it is among Baby Boomers. On the other hand, Online Video is roughly twice as popular among Millennials as it is among Baby Boomers. The trend is not necessarily going favorably for Live TV with regard to age. In fact, our data suggests that those below the age of 42 are actually more likely to consume Online Video than Live TV. While we are able to put numbers on this trend in the above graphics, the overall theme is likely not terribly surprising to you. Naturally, you may be wondering if this trend is contingent on other factors. One potential factor that we thought would be interesting to investigate is income. Specifically, we hypothesized that because younger consumers have less disposable income, they are therefore less able to afford Live TV packages that can be pricey and less flexible. Our data suggests that while this may be occurring at some level, it is ultimately dwarfed by the age dynamic. 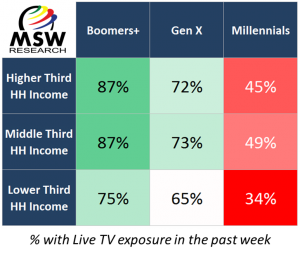 When we dive into the data split by age and income tiers, having a middle-to-higher income appears to yield a higher likelihood of having exposure to Live TV – among all age generations. 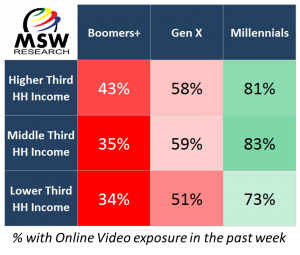 However, even among the middle-to-higher income consumers, there is still quite a gap between Boomers and Millennials of around 40 points. Perhaps even higher income Millennials are constrained by their disposable income levels – as they are more likely to be paying off student loan debt as well as the earlier stages of mortgages, etc. than their older counterparts. That said, this sizable gap between Boomers and Millennials hardly budges regardless of income levels. Net: The higher income tide raises all ships, but there is still a very strong age dynamic that does not go away. With Online Video, there are some similarities to Live TV in that the more income you have the more likely you are to be exposed to Online Video. Most entertainment costs at least some amount of money, so this trend among income tiers makes sense. However, regardless of income, there is still a sizable gap between Millennials’ Online Video consumption and that of Baby Boomers – nearly 40 points here too. This data suggests quite a change is occurring with these mediums. Change can be uncomfortable, but it is quite an opportunity for greater success among those who are prepared. 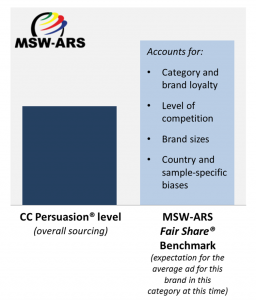 We here at MSW Research have many different tools that provide a validated assessment of advertising effectiveness across both Live TV and Online Videos – or a campaign involving both or more. We can help guide you through these changing times with solutions that are both trusted and flexible. For more information, please contact Art Klein at aklein@mswresearch.com. Across categories, companies/brands will oftentimes create an advertising initiative that is meant to target a certain competitor, or groups of competitors. In doing so, they likely employ a communication strategy that they believe will target those consumers currently purchasing products/services from said competitors. The problem is: How do they actually know if their communication strategy is going to source from the desired competitors – and at optimal levels? 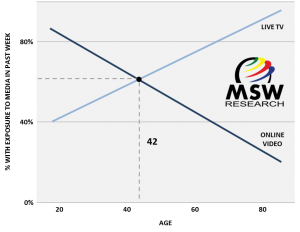 Luckily, we at MSW-ARS have the perfect solution that quantifies this, and it utilizes our validated CCPersuasion® metric that has been proven to predict Marketing Mix Modeling (MMM) results. 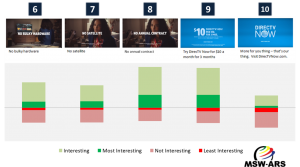 Is the ad driving sourcing appropriately from the overall competition? Are the targeted competitors driving this result? We want to use this blog entry to show you how we are able to do this while utilizing background information on our collection method as well as a real example of this data. First, let’s give some background on gauging overall sourcing. How do we compute the overall result? Our CCPersuasion metric utilizes a competitive category set of brands/companies, which enables us to assess which respondents have a predisposition to favoring each competitor. We are then able to see what happens to these groups of consumers once they are exposed to the test brand’s advertising. The net shift toward the test brand is called CCPersuasion, or CCP for short. The CCP level is evaluated against our Fair Share® Benchmark, which incorporates category dynamics like brand and category loyalty, level of competition, brand sizes, and country-specific biases. By comparing to Fair Share, we are then able to determine if the CCP level (thus overall net sourcing to the test brand) is above, below, or at the average. Next, we can examine how each competitor is affected by the test brand’s advertisement, contributing to the overall CCP score. 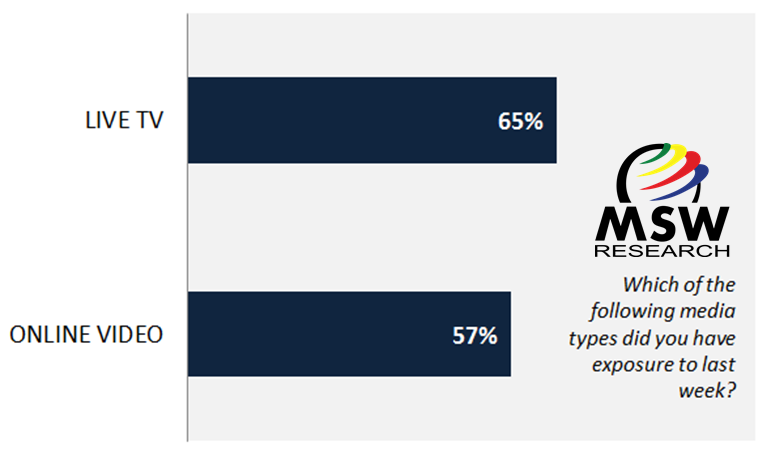 In this graphic (above), from a blinded study, we can see that Brand E is losing the most to the test brand while Brand A is losing the least. However, what is not clear is what we should be expecting from each competitor. Brand A: We initially saw sourcing from this brand was the lowest, but this data shows that perhaps that should NOT have been the case. Even though it lost less to the test brand, Brand A is actually much larger than Brand B – and should have lost more than it did. Brand B: The -2.0 loss for Brand B did not seem impressive in the initial graphic, though it turns out Brand B is actually the smallest competitive brand in this set – thus their loss to the test brand is actually greater than expectations. 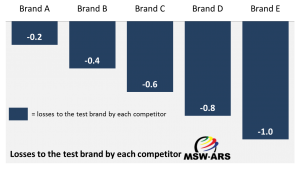 Brands C & D: Both of these brands are contributing to the test brand’s CCP result, but we now know with this graphic that they are actually the two largest brands in the set – thus their losses to the test brand actually should have been even greater. 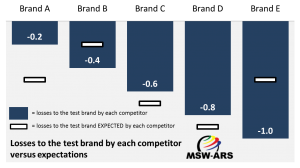 Brand E: We knew from the initial graphic that Brand E was a stronger driver of CCP results, but what we did not realize until now is that they are actually losing a disproportionately high amount of their consumers to the test brand. Now, let’s take a look at a real case study. This is an example for a recently aired DirecTV NOW commercial that was tested by MSW-ARS. This ad ran heavily during the Spring 2018 months. If you watched a lot of March Madness coverage, then you may very well remember seeing this ad. It is the same study we used in the Scene-To-Scene blog from last month in case you’re interested. Far and away the top driver of trial to DirecTV Now in this test is cannibalization from traditional dish-oriented DirecTV – which is sourced far beyond their expectation. This DirecTV Now spot includes strong branding cues for DirecTV, and includes messaging around “No annual contract” – which we saw work well in the data explored in the previous Scene-To-Scene blog – and are likely driving this result (traditional dish-oriented DirecTV typically requires a contract). 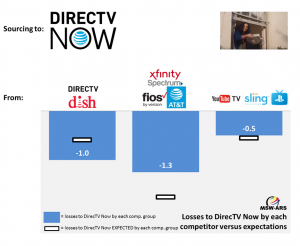 Dish Network also loses to DirecTV Now at a slightly higher than expected level, supporting this notion. Fellow over-the-top media services, PlayStation Vue, Sling, and YouTube TV, also contribute to DirecTV Now’s gains – though slightly lower than expectations. This is likely due to the focus of the spot being more on the “out with the old, in with the new” thought – and these companies are already in the “new” – thus not necessarily targeted by this argument. 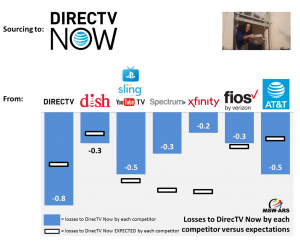 Traditional cable companies and internet service bundles, as a whole, do not contribute to DirecTV Now’s gains as much as one may expect given their market share – they fall well below expectations. Arguably, the main knock on these companies in this spot is around “no bulky hardware” and “get the live TV you love” – both of which are not powerful in driving the spot. The under-sourcing from traditional cable companies and internet service bundles is even more apparent when you remove AT&T from that group as they are actually bucking the trend and losing to DirecTV Now beyond expectations. As you may know, AT&T is the parent company of DirecTV (and DirecTV Now), and the AT&T logo is embedded within the DirecTV Now logo. This appears to be garnering the attention of current AT&T internet service bundle subscribers. One of the most powerful scenes is the “Try DirecTV Now for $10 a month for 3 months” scene, which is featured amidst AT&T branding cues. We expect this spot to do more to drive dish-users to DirecTV Now than other OTT media service and non-AT&T traditional cable users. 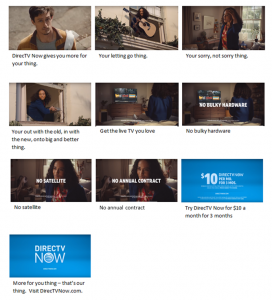 DirecTV dish-users and AT&T internet service bundle subscribers are expected to drive their respective sub-categories in switching to DirecTV Now after seeing this spot – likely in part driven by their familiarity with the companies, and the messaging speaking more to them. This degree of cannibalization is probably not ideal for DirecTV and AT&T. However, given the changing landscape of this category, which includes consumers moving more to streaming options, it may be wise to point out that at least DirecTV/AT&T are driving consumers to their streaming option with this spot rather than losing them outright to a competitor.